About us - Sharehouse "Soleil Waseda"
Are you interested in sharing a house with other like-minded women? If so, please read on. Soleil Waseda is a women’s-only furnished share house located in the Waseda neighborhood in Tokyo. 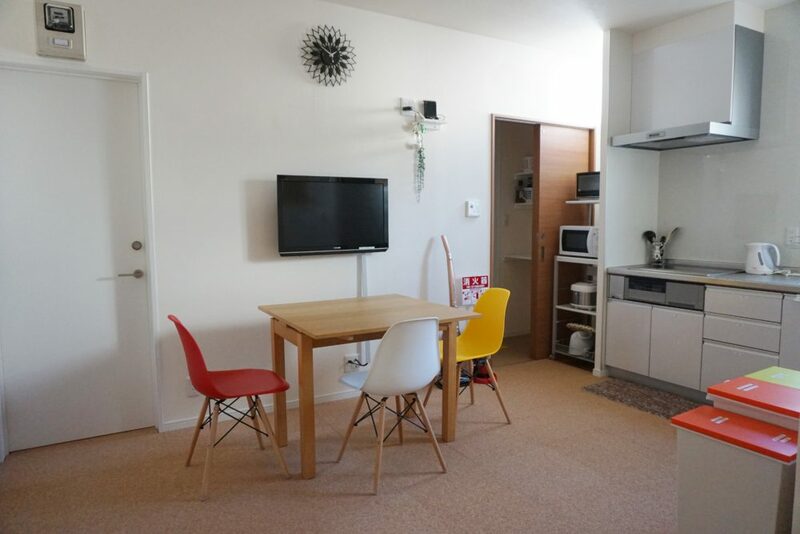 A mere five minutes from the nearest Metro station (Waseda Tozai-line), the house is conveniently located nearby Waseda University (3 minutes walk), and also located near other major universities and Japanese language schools in areas such as Waseda, Shinjuku, Shin-Okubo, Takadanobaba, Mejiro, Gokokuji, Yotsuya, Kojimachi, Ikebukuro, and other major spots in the Tokyo vicinity. The Waseda community is known for its friendly students, set in a safe environment and surrounded by nearby parks, such as Chinzan-so, a well-known Japanese garden. Soleil Waseda is a short walk away from the Kanda River, a popular sakura viewing spot in the spring time. The neighborhood is easy to access and live in, with several supermarkets and convenience stores in the area. There is a little bit of everything here. There are five private rooms on the second floor of the complex which make up the share house. The rooms allow complete privacy, yet there are still opportunities to socialize with other sharemates in the common area, where people can hang and gather. The owner, Naoko, lives on the first floor. She speaks English and can assist you when you need help! Soleil Waseda is not just a place to live – it is truly a space where people can form a new community while experiencing life in Japan. We have basic house rules in order to maintain a safe and comfortable lifestyle for our sharemates. One of the requirements of living in the sharehouse is to adhere to the weekly cleaning schedule. Tasks include proper garbage disposal and cleaning common spaces. Though it may seem at times tedious and annoying, abiding to a regular cleaning routine helps uphold and sustain a positive living experience which cultivates respect among other sharemates. If you would like to live in a place where you can live in a clean, safe, and friendly environment, here’s just what you are looking for! Hello! I’m Naoko. Waseda is my hometown. This is a warm and friendly neighborhood where the neighbors greet each other. I love this town! I believe this is not just an opportunity for you to “live in Waseda”, but to become one of the neighbors and get deeply involved in the community. You can do things such as joining the local festivals and getting to know your neighbors who will help you in your new chapter of life in Japan, and help you learn and appreciate Japanese culture & events, which you would not be able to learn only from schools and books. In French, “Soleil” means the sun. The home is named as such, because of my dream to create an environment where all feel welcomed… a place where everyone can have their “warm place in the sun”, where people from around the world can come together and enjoy life in Japan. Please consider living in this house, and have a great time in Japan!